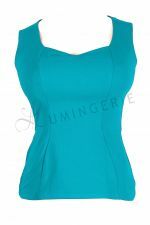 Did you know that right after black, turquoise is the next popular colour in swimwear. It's also becoming more and more popular in lingerie. Turquoise, bright blue, navy blue, you name it, we have it.